Optogenetics is a new area of research and application which combines optics and genetics. This technique is used particularly to identify neuronal networks. Optogenetics rely mostly on a protein, channelrhodospin, which is activated by blue light. Nerve cells which express this protein can then be activated themselves by blue light, introduced through an optical fibre. 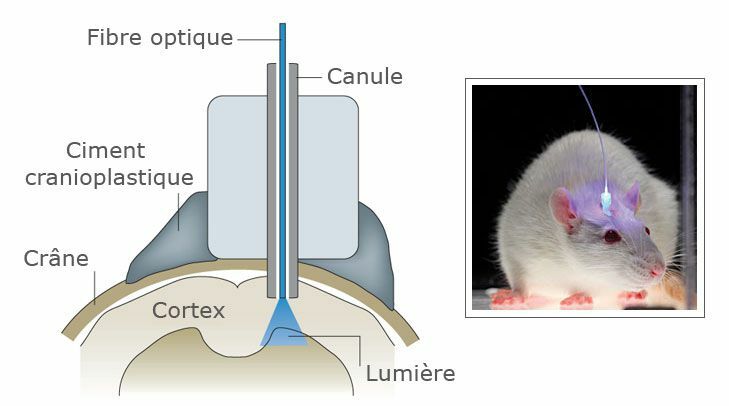 Mice which have been genetically modified to express the protein in specific neurones and which have an optical fibre connected to their brain turn frenetically to the left when the optical fibre sends blue light to these neurones. This new area of science appears to have limitless future applications, both to improve understanding of the function of the brain and design new treatments for neurological diseases (Parkinson's) and for less ethical purposes (robot-animals, etc. ).